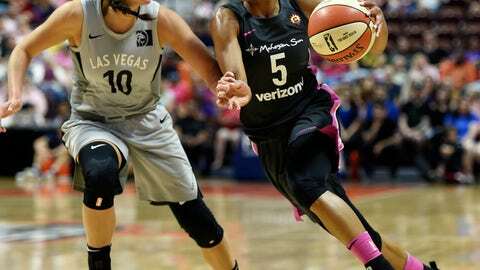 The WNBA’s Las Vegas Aces thought they’d make a statement by refusing to play a game because they were tired from a long day of travel. It didn’t quite turn out like they planned. The team ended up forfeiting the game, which could very well cost it a spot in the playoffs. And the conversation that players wanted to start about the rigors of travel ended up falling on mostly deaf ears. Turns out fans don’t want to hear about how tough it is to play basketball for a living. They just want players to show up and play. So does the WNBA, and with good reason. The league struggles enough to draw fans without inconveniencing and alienating those who have actually bought tickets for a game. It had little choice on Tuesday but to hand the Aces a pivotal loss by declaring last week’s skipped game against the Washington Mystics a forfeit. That not only cost the Aces in the loss column but seriously damaged their chances of making the playoffs. Score one for the fans who showed up in Washington with tickets for the game, only to be told to go home. And score one against a players’ union that doesn’t seem to understand the WNBA is not the NBA, no matter how much the players want it to be. There are no $40 million salaries in the WNBA, and certainly no private chefs. The flagship team plays most of its games in a 2,500-seat arena, and many players compete in overseas leagues to boost their paychecks. The last fact seems to be the sticking point with the WNBA’s players’ union, which would love nothing better than to have all players fly charter jets to games. Barring that, the union at least wants restrictions on games played while crossing two time zones or more. The Aces provided a perfect test case, along with a chance to dramatize the difficulties of travel. Their original flight canceled, the Aces spent 26 hours traveling from Las Vegas to Washington, arriving midafternoon in the nation’s capital for a game that night. A tough day of travel, yes. Some of it documented by players themselves, who weren’t afraid to go on Twitter to complain about it. The WNBA tried to accommodate the Aces, moving the start of the game back an hour to give them more time to prepare. It was breast cancer awareness day in Washington, and a decent-sized crowd of some 5,000-6,000 was expected for the game. But when the Aces finally got to their hotel, they decided they would be risking injury by playing tired. The decision not to play didn’t sit well with Mystics coach Mike Thibault, who told a story about when he was coaching in Connecticut in 2003 and a massive blackout hit the East Coast while the team was in Cleveland. The team took buses to Connecticut and then to New York City, showing up 52 minutes before tipoff. “If you’re there and in the city and can play, you should show up and play,” Thibault said. Indeed, they should. But no one seemed able to explain that to the Aces, or warn them of the consequences should they decide against playing. Now, instead of being known as the team that took a stand and forced the WNBA to make travel easier, they’ll be known as the first team to miss the postseason because players didn’t get enough sleep. That’s a consideration when trying to grow a fan base in a new city. The Aces haven’t exactly followed the Vegas Golden Knights in taking Las Vegas by storm, and casino operator MGM owner has been offering free tickets to credit card holders to boost attendance in the arena on the Las Vegas Strip. In a perfect world, WNBA players would make more money and get charter jets. But the league has been around 22 years now and, despite improved television ratings this season, there is no indication it will ever grow big enough for the players to be lavished with the same riches and perks the men get. Meanwhile, the fans in Washington missed out on a game. The fans in Las Vegas will likely miss out on the playoffs. All because the Aces decided not to show up and play.